“Why would you do something like that?” the teacher asked. As a nine-year-old, DeLisle became fascinated by the many voices that chorused within her. She would trap some of them on a tape recorder as they escaped. In these one-girl radio shows she recognized an ability to hide behind her characters—a power, like any power, that came to be abused. As a teen, she’d play a dangerous game, picking random men’s names from the phone book and dialing the numbers. If a woman answered, she’d ask for the man of the house in a seductive voice: Is Terry there…? Well, tell him that Candace called.… Oh, he’ll know who it is. You can imagine how this went over. Eventually DeLisle moved to Los Angeles to become an actor. This was in the early ’90s. She’d done theater in high school. She’d played monkeys and old ladies and a tree, a variety of odd and interesting characters. In L.A. it seemed she could play only the “20-year-old girl.” It was limiting, and besides, she was uncomfortable in her skin. So DeLisle found her way into voice acting, which seemed like a better use of her powers than destroying marriages. 1. But it’s almost her face: DeLisle has the dark hair and pale skin of Catwoman. The actors often seem to resemble their characters. How this physical affinity factors into the decision to cast an actor is anyone’s guess. It could also be that the voice is so tied to the character that I end up reverse-engineering a resemblance. But there are places where people will know her. One is the Internet; there fans meet and discuss and argue and elevate voice actors to a strange kind of celebrity. The other is the Internet’s real-world avatar, the convention, or in fanspeak, the “con,” the biggest of which—San Diego’s Comic-Con International—drew about 167,000 people during its four-day run last year. At these events people will line up to meet DeLisle. They’ll dress up like Catwoman or Daphne or some of the hundreds of other characters she’s played and journey to any of the dozens of comic and anime and gaming conventions going on practically any weekend in America and beyond. They’ll sidle up to her and get her autograph and smile and snap a selfie, even though the famous part of her won’t show up in the image. Her face, her actual face, is just another curious artifact of the digital age. “Now we’re all little celebrities in our own little world,” DeLisle says. This story is about that, about this part-time fame. 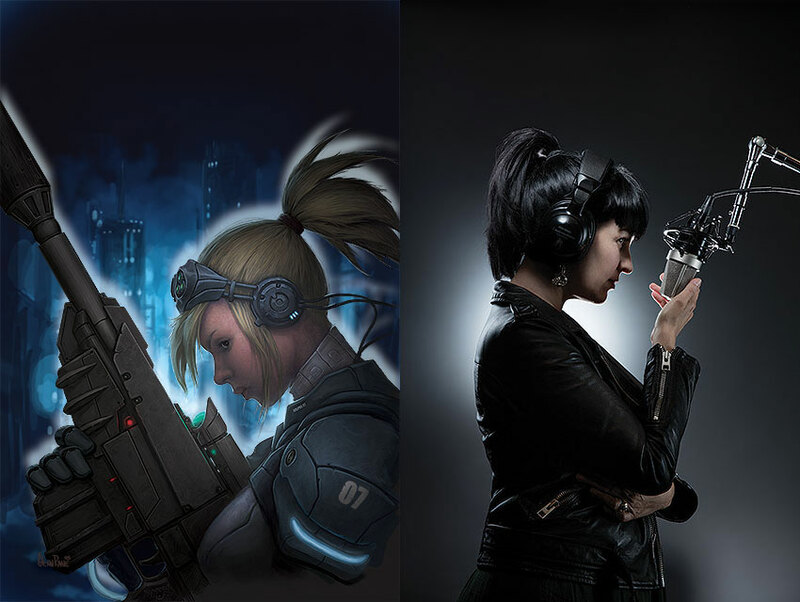 It’s particularly about voice acting for video games, because while most voice actors don’t work primarily on games—DeLisle says games make up only 30 percent of her income—what’s happening in this “little world” of video game voicing has a lot to do with the future of celebrity and almost certainly the future of media. Nowhere is this possession more evident than in Los Angeles, home to most of the big-name voice actors. Some of them you possibly know—Hank Azaria does voices for The Simpsons but also shows up constantly onscreen. There are many, many others who live primarily or exclusively behind the mic. L.A. is where the production companies are, and not just for TV and film but for games, too. Three of the largest—Activision Blizzard,2 Riot Games, and Naughty Dog—are headquartered in the Los Angeles area. 2. Activision and Blizzard Entertainment are subsidiaries of Santa Monica-based parent company Activision Blizzard. The studios work independently to produce their own games. Activision makes, among other products, the Call of Duty and Guitar Hero series. Blizzard Entertainment’s main campus in Irvine gives the impression of being exactly what it is: a hybrid of Hollywood studio and tech company. To get in, check with security at the gate and drive under the soaring company sign and into a standard-looking office park. Walk past the statue of an orc with an upraised ax riding a giant wolf, ringed by inscriptions of the company’s eight core values, a gamer’s Bill of Rights that includes “Gameplay first,” “Embrace your inner geek,” “Every voice matters,” and “Play nice, play fair.” The young employees in flip-flops, the breezy SoCal casualness, the lush and ever-thirsty lawn—they’re a trick of the light. This is not a local company. Blizzard has a Global Network Operations Center, a dark room with computers and lots of flat screens on the walls. Some screens display heat maps of all the games’ players currently online around the world (in every country but North Korea, so the company says). Some are tuned to the Weather Channel, watching for cyclones or tsunamis that might take down the servers (to say nothing of the players). Notably another core value is “Think globally.” If the NSA were fun, it’d be like this. Blizzard is responsible for very successful “massively multiplayer online role-playing games,” including the World of Warcraft series. The company employs 4,000 people, and with sister company Activision in Santa Monica, it’s the fifth-largest maker of games in the world. Blizzard titles feature mythological figures, aliens, superheroes—hundreds of characters that need voices, even if it’s just for a few lines. Owing to the popular interest in its products and to the value of corporate intellectual property, Blizzard is as secretive as a smallish nation. But then it makes as much money as one. The company brought in $4.66 billion last year, roughly equal to the GDP of Barbados. The nondisclosure agreement is the company’s first line of defense, which your narrator signed without, admittedly, reading too closely but which must have promised terrible punishments if sensitive information were released. So while I am allowed to attend a recording session near Universal Studios for the forthcoming title ____________ a few days after my Irvine visit, a lot of the details are, I’m pretty sure, off-limits. At L.A. Studios, an audio recording outpost on Cahuenga Boulevard, a dozen people are in a booth—engineers, producers, and Toyias, who today is serving as director. 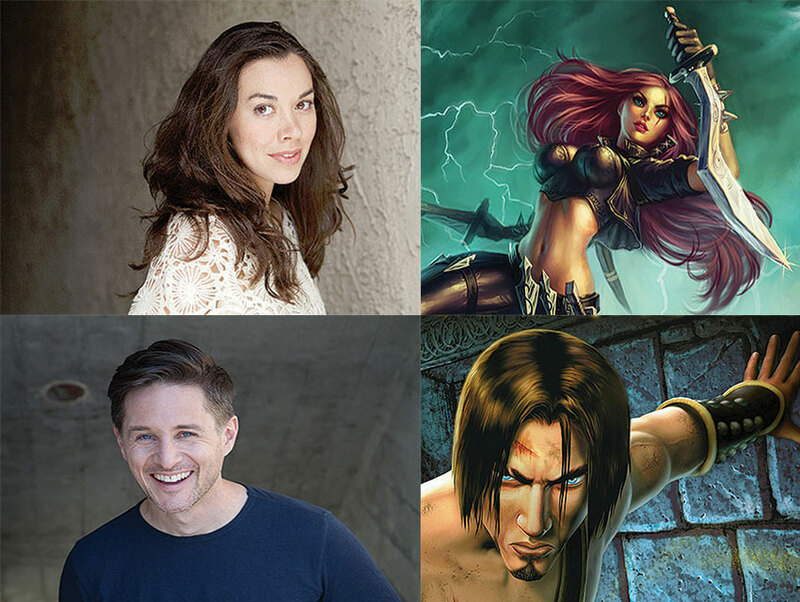 On the other side of the glass is Yuri Lowenthal, who voices characters for games like Prince of Persia3 and Castlevania as well as for anime and cartoons—notably Ben on the Cartoon Network series Ben 10 and Sasuke Uchiha on the manga show Naruto. Toyias cast Lowenthal as a drunken villager in Diablo, a Dungeons & Dragons-style game that Wikipedia describes, for once, best: “an action role-playing hack and slash dungeon crawler.” Lowenthal, who is 45, is here recording voice-overs, or VOs, for several characters. “Anything weird, I give to Yuri,” Toyias says. 3. Lowenthal is dark haired, sharp featured, and wiry. He looks as if he could be the Prince, who, for your reference, was played by Jake Gyllenhaal in the movie adaptation. The secret to successful voice-over is being able to find three ways to say the same thing. Lowenthal does this with aplomb, going down the script, issuing one-liners, which (it’s safe to say this isn’t giving away much) include “Die!” and “Hello!” and “Ha-ha!” The recordings are played back, and everyone decides which version they like best. 4.The book also says that eating a Granny Smith apple will cure the dry-mouth smacks. A session is four hours, and the pay is usually $850 to $900, though sought-after actors can negotiate higher rates and a main character for a game can require more sessions. But as actors I spoke with noted, the fee is still only a few thousand dollars for what may be a billion-dollar franchise. This fight is very contentious and very modern. Some video game designers and developers are asking, “Why should an actor waltz in, yell into a can for a few hours, and get royalties in perpetuity when a game can take three or four years to develop?” To that, actors answer that since the character voices are central to the game’s identity, actors should be compensated for their holistic contribution to the game rather than their hourly one. “And where,” developers ask, “would that voice be without the game we’ve created?” The response usually goes something like, “Well, why don’t you guys form your own goddamn union and get your own residuals?”—after which the whole thing goes predictably to hell. The actors, via the union, have taken their demands to the game companies, which have not returned to the table as of press time. When and if they do, the conversation will be one about who owns the property, and in what way, and how much everyone should participate financially.5 The video game’s relationship with the audience is worth paying attention to as well because it indicates media industry trends in general. You watch a cartoon character, but you are a game character. That voice becomes your voice. Passive is passé. (Tweet that out.) Interactivity is everything. American gamers—155 million of them—can’t be wrong. Voice actors are at the nexus of this evolving relationship. All this makes for some blurry distinctions between real and virtual, between celebrity and not, while getting downright existential in the process: Does a game have a soul, and if so, where does it reside? 5. That’s important, too. The video game industry worldwide made $91.8 billion last year. To wit: Global box office revenues this year are projected to be $41.3 billion. Not even the $88.3 billion made by filmed entertainment overall can touch games. 6. The celebritization of voice actors may have started with Mark Hamill. He was doing voice work long before he appeared in Star Wars, but when Hamill began voicing the Joker on Batman: The Animated Series, he got people thinking that a beloved actor could be behind every beloved voice. Voice actors frequently cite him as inspiration. With IMDb, fans can learn about the lives and work histories of their favorite voice actors. With social media, they can interact with them. With sites like Reddit, they can banter about them ad nauseam, as when Kiefer Sutherland replaced Metal Gear Solid ’s David Hayter and fans wondered whether he would get it right. That’s another wrinkle in the video game-celebrity complex: Game companies with the financial resources and a major title in development have taken a cue from Hollywood by casting marquee names. Kevin Spacey appears as the villain in Activision’s 2014 release Call of Duty: Advanced Warfare—and I mean actually appears; the performance was motion-capture. Given the amount of time people spend on games, it’s reasonable to assume that during those idle hours of “grinding” or “farming” (terms for that OCD behavior in which you do the same bit, fight the same monster, over and over to rack up gold or experience or whatever), gamers might be wondering who the heck Lowenthal and Platt really are and might want to meet the faces behind the digital faces. As it happens, this works out for everybody. Because as voice actors gain fame, they gain another revenue stream: conventions. Fans meet actors, actors get exposure, and conventions grow stronger as nodes for the culture. It’s a new economy of direct contact. “I think the convention experience and the convention boom also reflect a change in being able to earn a living as an actor,” says Lowenthal. “Once upon a time you could be an actor, and you could do a commercial or whatever and live off that for a year. But now it’s much harder to consistently make a living as an actor in this industry. So now you’ve got conventions where you can go for a weekend and make a little extra money, and I think that it’s becoming more popular among actors.” Lowenthal and Platt put together a semiautobiographical faux-doc about this called Con Artists, a chronicle of the 11 conventions they went to in one year. Eleven sounds harrowing enough, but the pair say they know actors who go to 50 cons a year, which is its own sort of grinding. In the course of researching this story, I attended cons in Sacramento, Seattle, Hartford, New York City, Vancouver, and Hawaii. Certain eternal verities emerged. For one, outcast communities form where self-expression is protected. Remember that cartoon with the sheepdog and the wolf punching the clock and chatting like American workingmen before resuming their ancient game of chase? Conventions are like that, a liminal space for incongruous characters to gather and talk shop and exchange compliments and design tips and have pictures taken (with verbal approval secured beforehand) by other attendees, who collect such absurdities themselves. The prop inspection table, or faux-weapons check, at the doors of most conventions is the intersection of safety and to-thine-own-self-be-trueness. Here’s where six-foot swords and arm cannons are proved to be unproved, where Master Chief and, say, Batman’s Harley Quinn wait patiently as their accessories are judged suitably harmless so that their menace can be that much more comfortably appreciated by the other attendees. Beyond the weapons checkpoint, there’s the main floor, where vendors of comics, videos, toys, hoodies, and the like power the capitalist center of the thing; there are the panels, where guests talk and audience members hope for something to be leaked or communities come together to discuss issues of importance; there are premieres of movies, games, comics; there are the kilts, there are the autographs, there are countless eyes nearly put out by people pointing at all the attractions; there’s often a Furry Parade (about which—look it up); there’s the statistical inevitability of ending up in someone’s picture of somebody else; there’s the cosplay repair, where wings are fixed and papier-mâché is repapiered; there are the lines for people you never heard of, for products you never heard of; there are a million attendees, but somehow you brush shoulders with the same folks again and again, right where American culture is happening, where it’s meeting itself or at least running into itself. The Internet, live. Now, add to the mix the actual humans who give voice to those characters. Celebrities have buttressed the con experience since the first San Diego Comic-Con, in 1970: stars of television and film (Star Trek and Wars), comic book writers and artists, sci-fi and fantasy novelists. In the past decade voice actors have begun appearing as well. You’ll probably see Phil LaMarr. If you took a core sample of American entertainment, you’d find concentrations of LaMarr at just about every strata. He is an original cast member of MADtv, a frequent guest star on sitcoms, and a voice on many, many cartoons: Justice League, Samurai Jack, Star Wars, and Futurama (as Hermes Conrad). He was Marvin—poor, sniveling Marvin—accidentally shot in the head by John Travolta in Pulp Fiction. He voices a lot of games now, too. In the past four years he’s started attending cons frequently. Sitting at the center of one of the greatest Venn diagrams in all of geekdom, perhaps that was inevitable. In his quiet hours, and probably when he’s staring down the barrel of a long line waiting to get his autograph, LaMarr has thought about the changes that brought him here. “People invest in these creations in a way that people don’t invest in more mainstream creations,” he says. It’s no secret that fandoms gather cyclonically around revered animation, comics, or obscure ’70s TV shows. There’s a simple test: While Futurama is more niche and Everybody Loves Raymond is more mainstream, “nobody is getting a tattoo of Ray on their side,” LaMarr says. What a world that would be! A generation ago, he says, people loved the voices, “but nobody knew who Huckleberry Hound was.” In these modern times “everybody can be an expert instantly.” The Internet, of course, is just a big box in an underground room in Arizona, powered almost entirely by nostalgia and masturbatory friction. About the latter, little need be said; as for the former, a desire to know who wrote that episode of G.I. Joe or voiced that one horse in that one show engenders a sort of scavenger hunt. There’s so much to discover. This explains why so often those interminable lines at cons lead right to someone you’ve never heard of: There’s a market for obscurity. 7. A trend among celebrities is to go to San Diego’s Comic-Con in disguise, to be able to move among the people anonymously like human Easter eggs and then post photos on their Twitter feeds. When Bryan Cranston wore a Walter White mask a few years back, he introduced all-new, all-different layers of metacommentary. And so the LaMarr-Reynolds Theory of Fame proposes that celebrity is a phase change. It depends on the environment: You’re ice or water or steam based on the presence or absence of heat; you’re anonymous or familiar or sainted based on the presence or absence of fandom. The future is strange, and not just because it’s now. Games are becoming more like films, which in turn are becoming more interactive however they can. The audience is interacting with the products online and in person, at conventions. The celebrity is famous here and anonymous there. Everyone’s roles blur, onscreen and off. The game is life. Recall “grinding.” Once again, gaming provides a metaphor for actual lived life. In this case you have the voice actors, shuttling between auditions and recording sessions and autographs, trying always to earn enough gold to survive and gain enough experience to someday possibly level up to a Triple-A game, a Pixar film, a role in a Paul Thomas Anderson movie. So the question is, When it comes to video games, where does the narrative live? The writers, developers, producers, and actors may create the character, but it lies inert in limbo until the player animates it with life and direction. All of them work together to build the character’s story. Who owns that property? The way the Interactive Media Agreement plays out will resonate through every medium that follows because nothing will be broadcast; it’ll just be. And be had. Brandon R. Reynolds is a Los Angeles writer. This is his first piece for the magazine. Previous articleAre Little Fixes the Secret to Boosting Metro’s Ridership?